Extreame Savings Item! Save 45% on the ZHMA Industrial Pendant Light,Hanging Retro Vintage Style,Black Metal Ceiling Light,barn Light,for Kitchen Island, Dining Room, Bars, Warehouse,E26/E27 Base by ZHMA at My Athenas. MPN: TY23BlackUS5-P. Hurry! Limited time offer. Offer valid only while supplies last. Classic Mini Retro Pendant Lamp This vintage and classic style, decorative in the room does not seem obtrusive and gives you an old time feeling. High quality metal lamp shade, embedded fixture, safer.the surface after grinding and spray paint processing, more wear-resistant. Each chandelier is equipped with a high quality circular chassis with a diameter of 12CM. This antique pendant features on 180MM in diameter of the round umbrella metal shade, with up to 1.5M black plastic cord to customize your lighting need. Installation is convenient, no need for extra damage to the ceiling, a direct fixed parts, fitted with a light bulb can be used safely. For a safe and secure installation, please ensure that the electrical box to which this fixture will be mounted is properly attached to a structural member of the building. All wires are connected. When unpacking, be careful not to pull with wires as a bad connection may result. Do not connect electricity until your fixture is fully assembled. Perfect size:E26/E27(Bulb NOT included) 18CM diameter,1.5M adjustable cable cord to suit different length requirements and ceiling heights. 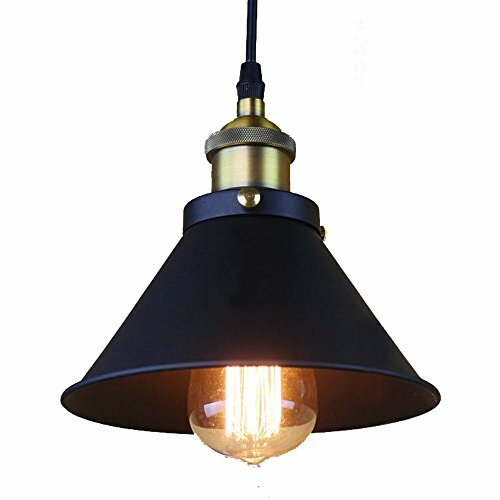 Unique and exquisite design: American industrial vintage style, matt-black metal shade, add a rustic and classy favor to your home, perfect for retro decoration, ideal for using in dining room, kitchen Island, hallway, warehouse, café, etc. surface of aluminum alloy is treated by spraying. It is wear-resistant, corrosion-resistant and prolongs its service life. Note:Must be hardwired, there is not a switch or plug on the fixture itself. If you have any questions about this product by ZHMA, contact us by completing and submitting the form below. If you are looking for a specif part number, please include it with your message.